Jason Kander (D): I’m Jason Kander and if I look familiar it’s because I’ve probably stood on your doorstep. I’ve knocked on a constituent’s door nearly twenty thousand times over the last three years. When you’ve stood on someone’s porch and looked them in the eye you take personally the task of protecting their job, managing their tax dollars wisely, and keeping their neighborhood safe. That’s why the work that I do is so personal for me. That’s why I offered the first real ethics reforms to become law in Missouri in twenty years. Why I cut funding, perks and fringe benefits given to legislators as a way to afford medical coverage for Missouri’s poorest kids. And it’s why I went after wasteful spending and worked with members of both parties to balance the budget. I’ll keep walking and knocking. I’ll keep listening. And I’d be honored to have your support again this Tuesday. 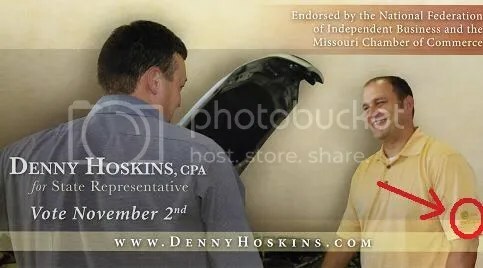 Interesting, Denny Hoskins’ (r-noun, verb, CPA) campaign in the 121st Legislative District and Rick Brattin’s (r) campaign in the 124th Legislative District were the largest beneficiaries of the “GOTV calls” if that’s what the campaign finance report label for desperate homophobic robocalls is these days. A. ITEMIZED CONTRIBUTIONS RECEIVED FROM COMMITTEES REGARDLESS OF THE AMOUNT, OR FROM PERSONS GIVING MORE THAN $100 TO A COMMITTEE. Maybe we’ll pick up the phone on Monday to give these folks a call and ask them if the know what their contributions to the HRCC have been funding of late. Asked about Breitbart’s history of unethical behavior and misinformation, ABC News’ David Ford told Media Matters: “He will be one of many voices on our air, including Bill Adair of Politifact. If Andrew Breitbart says something that is incorrect, we have other voices to call him on it. ABC’s explanation for this is woefully unpersuasive — if the right-wing hatchet-man starts lying on the air, “we have other voices to call him on it”? Here’s a crazy thought: if ABC News has reason to believe Breitbart might try to deceive the network’s audience, then maybe he shouldn’t be part of the election-night broadcast. For that matter, this isn’t exactly a recipe for quality journalism — Breitbart will spew propaganda; others on the broadcast will be there to “call him on it.” Viewers will, in other words, hear some falsehoods and some corrections, but won’t necessarily know who’s right. In case you haven’t had a chance to develop an appreciation for Mr. Breitbart and Ms. Loesch’s journalistic depravity, Mediamatters offers some links to a few of the highlights of Breitbart’s career; specifically check out the link titled “Wild accusations over Gladney case.” Not only does this link detail a St. Louis event, but Dana Loesch was intimately involved in helping to manufacture a fringewing cause celebre out of poor, inept Mr. Gladney and in pushing it as hard as she could, no matter how she had to fib. It should give you an idea about why it’s is so disturbing that ABC would let either of these night crawlers out into the light. Some amusing comments on Benen’s post about Breitbart and Loesch on ABC: “… it’s like asking Jeffrey Dahmer to work in a restaurant kitchen“; “What, David Duke was unavailable? “; “… Micheal Vick will be doing commentary for the Kensington Dog Show“; and “That is why comedians deliver news these days while news organizations now do really bad comedy.” Not so amusing, to paraphrase another comment on Benen’s post, is the fact that if the Tea Party does well on Tuesday night, we can expect to see more of this opportunistic pandering to the fringewing crazies in the future. If you think that these two ethically challenged, hyper-partisan hacks have no place outside of Fox news, let ABC know that you will be watching election coverage elsewhere next Tuesday (and in the future, if this pattern persists). And be clear that you are not objecting to conservative commentary, but to dishonest and unethical pseudo-journalists being legitimized by what has been, until this event at least, a more or less respectable news outlet. You can offer ABC News feedback here. Update: Steve Benen reports that ABC is feeling the heat; issues clarification of Breitbart’s role – he’ll be part of an online panel only. What about Loesch, online only as well? The nasty republican robocall that started it all. …Rep. 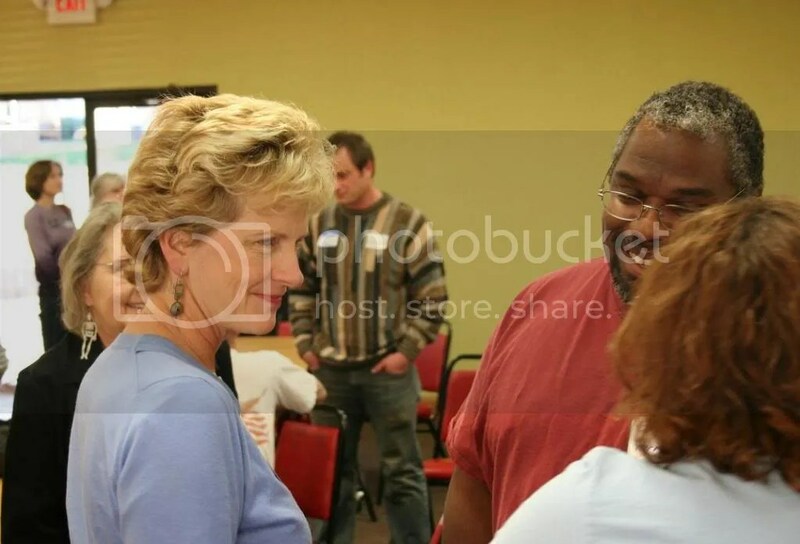 Denny Hoskins sought to distance himself Thursday from a robocall barrage targeting his Nov. 2 Democratic opponent…. 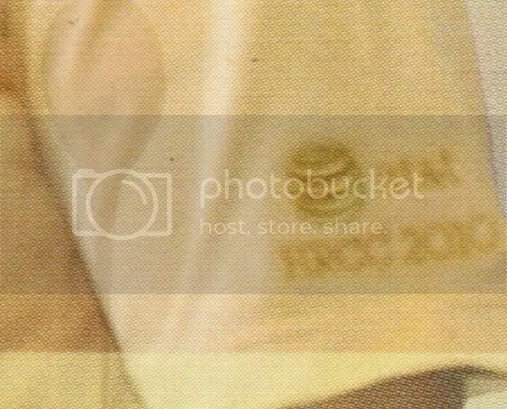 Nice shirt. Where’d you get it? Yesterday Courtney Cole‘s (D) campaign ran a robocall in response to the HRCC’s sleazy effort last Wednesday to promote homophobia. 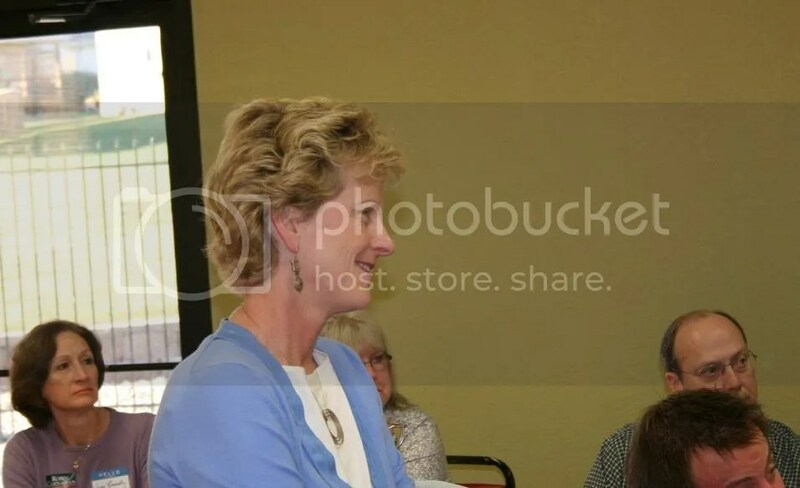 Hello, this is Courtney Cole and I want to apologize to you for a phone call that my opponent sent out this week which contained false allegations attacking our Christian values. My husband Jason and I raise our little girl, McKenzie here in the 121st district and we should expect integrity and decency from the campaigns of our local candidates. Unfortunately, some people are willing to attack our community and my Christian values for their own political gain. I ask for your support to allow me to represent the values that make our community a wonderful place to live and work by voting for me on Tuesday. 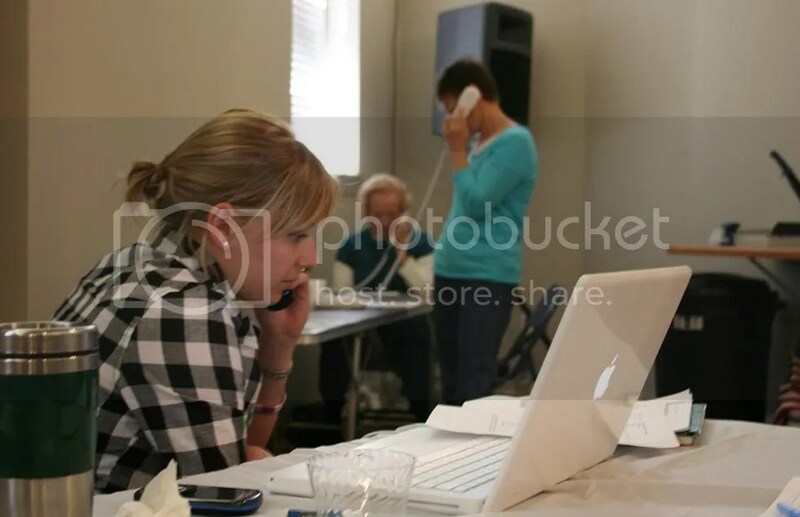 If you have any questions, please call me at home… or visit my website at http://www.votecourtneycole.com. Paid for by Cole for House, Laurie Squiric, Treasurer. 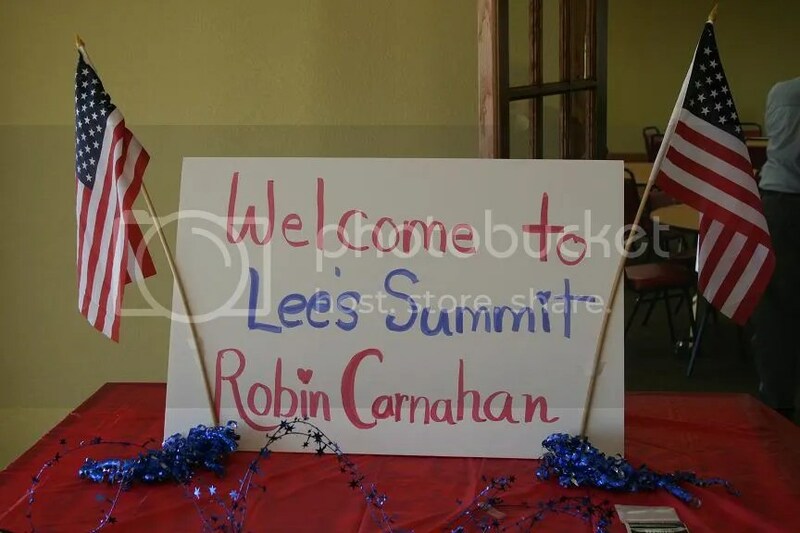 Missouri Secretary of State (and U.S. Senate candidate) Robin Carnahan (D) made a quick campaign stop in Lee’s Summit in eastern Jackson County late this afternoon. This was one of those events, in a long series for the day, that takes place in the last seventy-hours of a campaign as the get out the vote operation shifts into high gear. Those attending this event are the folks who tend to be Democratic Party activists who will be instrumental in making the calls and knocking on doors to turn out the Democratic vote in the final hours leading up to Tuesday. 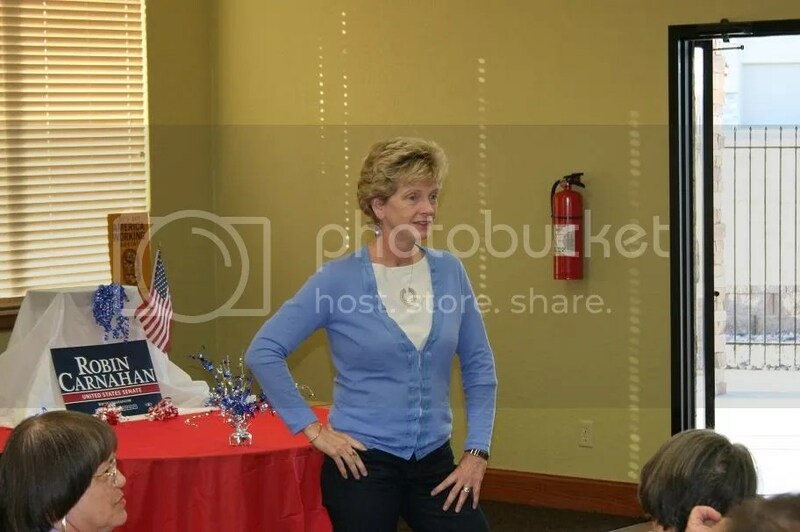 Robin Carnahan (D) spoke for a few minutes to the crowd about the importance of turning out every vote. She reminded everyone of past close elections. 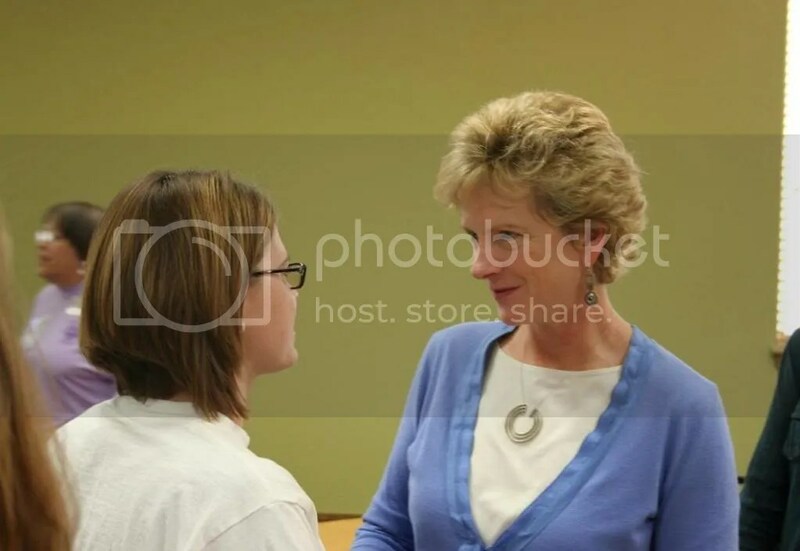 After her remarks she took time to greet everyone in attendance and give and accept best wishes along with encouragement for the next few days. Then it was back on the bus for the next event of the day. Listening to a question about the campaign. In the last seventy-two hours before the polls open campaigns kick their get out the vote operations (GOTV) into high gear. 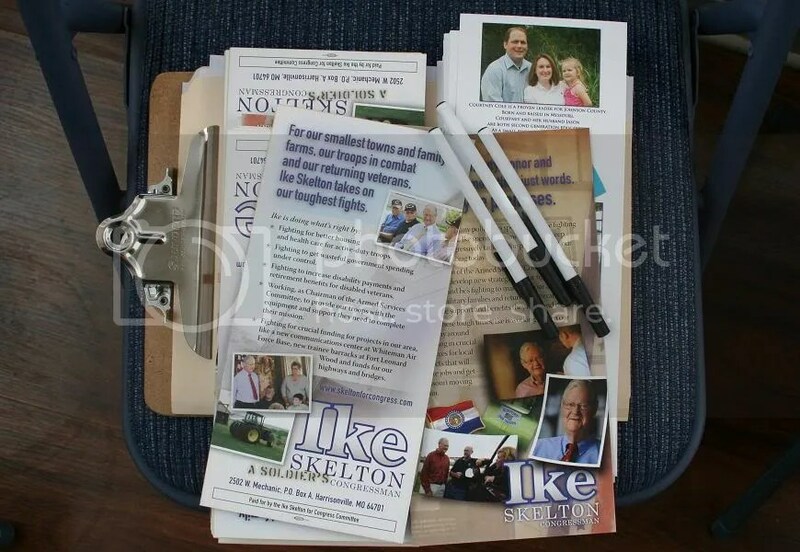 Congressman Ike Skelton’s (D) operation has phone bankers and canvassers out in force today. Phone banking is scheduled from 9 a.m. to 8 p.m. in shifts. A packet of materials for door to door canvassers. There are three more days of intense work to go. Another Democrat fighting sleazy robocalls is Kelly Schultz in Boone County. Here’s the ad she’s putting up today. Schultz ran against the Republican incumbent, Steve Hobbs, in 2008 and got 44% of the vote. Now that Hobbs is termed out, Schultz’s Republican opponent, John Cauthorn, apparently remembers that the seat was held by a Democrat before Hobbs. The Republican powers that be must be worried on Cauthorn’s behalf that Schultz could beat someone who didn’t have the incumbent advantage.